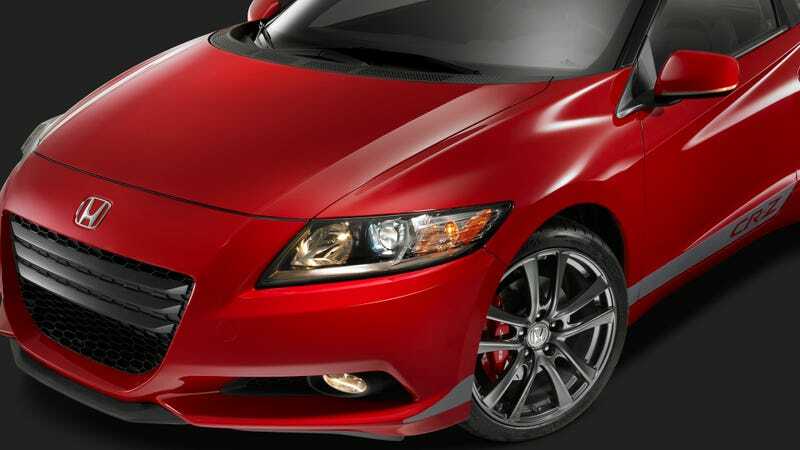 The whole point of the Honda CR-Z was that it was going to delivery a great driving experience with incredible gas mileage. Well, the mileage wasn't fantastic and the drive wasn't the best. So now HPD gave up and stuck a gas-sucking supercharger on the car. The centrifugal supercharger boosts power up to 187 hp and 171 lb-ft of torque compared to the stock hybrid combo's 130 combined horsepower and 140 lb-ft of torque. The gas mileage probably plummets whenever you go heavy on the throttle, but surprisingly, the car remains relatively clean. Thanks to some ECU calibration, the car still meets Super Ultra Low Emissions Vehicle (SULEV, yes that's a real thing) standards and is 50-state compliant. HPD also offers a limited-slip diff in the car, as well as new brakes, clutch, springs, dampers, exhaust, and front and rear spoilers. Automobile Magazine reports all the mods run something around $6,000. If you're adding that onto a base CR-Z, that puts you right around the price of a no-options FR-S or BR-Z. Is it the lower, faster, thirstier CR-Z you've always wanted? Possibly. Supposedly the extra power livens up the whole car, but if they're going to make it less fuel-efficient, why not just stick a Civic Si motor in there?